ART CRAZY NATION: at last a book about the British art world, which is sympathetic and informed but not at all afraid to be incredibly rude. How has the art world changed since Blimey! first hit the bookstands five years ago? Is London's new Tate Modern good or a plastic tourist attraction with religious mumbo jumbo sprayed on, like magic fairy dust? Is being a Marxist in today's art world little more than a market choice? Curators: anaemic zombies or twenty-first century Easy Riders, art's answer to Sly and the Family Stone? Is it right that art must be sanctimonious to be good? Why are we like this now and how long will it last? 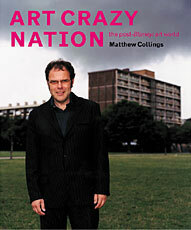 In Art Crazy Nation Matthew Collings doesn't set out to provide black-and-white answers to these questions. Instead he describes what art in Britain has become and how the art world is thinking. He offers a slice of the contemporary art zeitgeist.